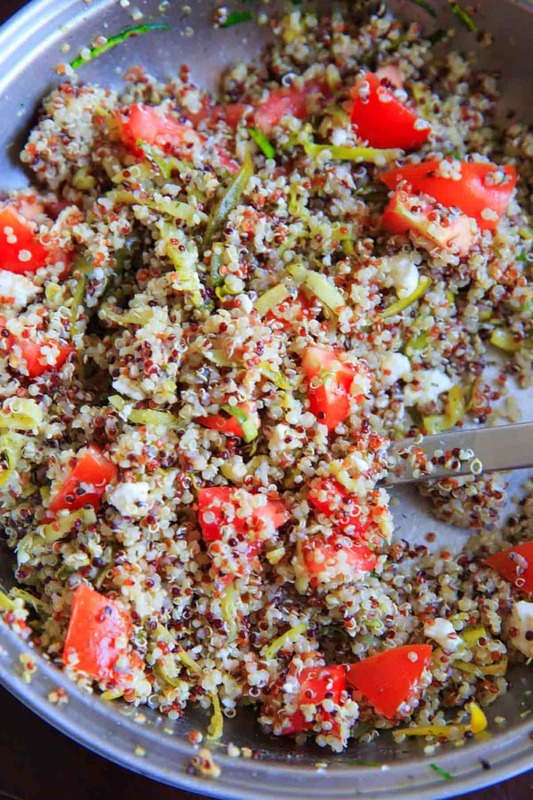 Spiralized Zucchini Quinoa Tomato Salad. Eat as a side or a light meal, cold or hot! Healthy, vegetarian, delicious. I HAVE A NEW FAVORITE THING! It’s called the Vegetarian Flavor Bible. <– Have you heard of this?? Basically it is a huge book of ingredients that you can flip through to see what flavors go together while creating a recipe. So when you’re feeling like something is missing, but you just can’t quite figure out what – this’ll help you out. It started out because I had written down “zucchini quinoa casserole” on my meal prep list. 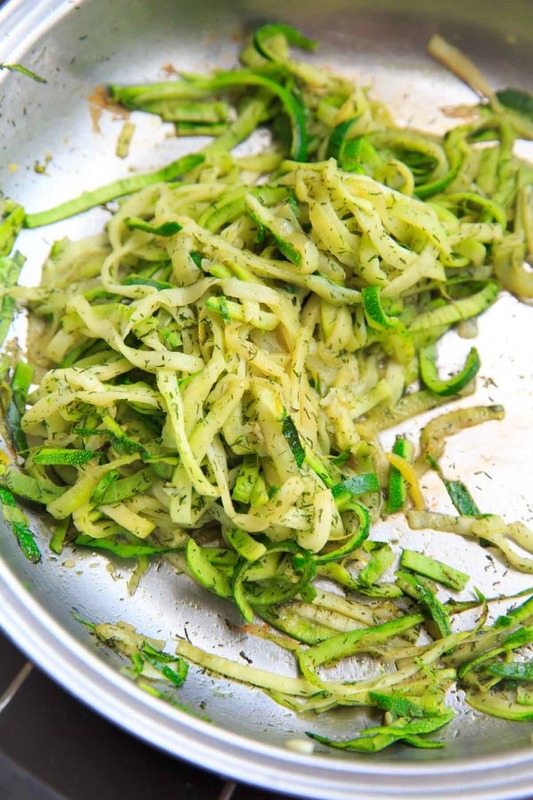 That sounded a tad boring at first so I decided to jazz it up a bit by spiralizing the zucchini. There wasn’t much of a plan going in. Good thing it only takes a couple minutes to saute. Added dill as well. Then I added it to cooked quinoa with cumin. Even with those spices, it was missing something! That, I figured out on my own. But after serving to myself and a friend, I realized it was STILL missing something. After salting the quinoa (because I forgot the first time around), I turned to my trusted new favorite resource. 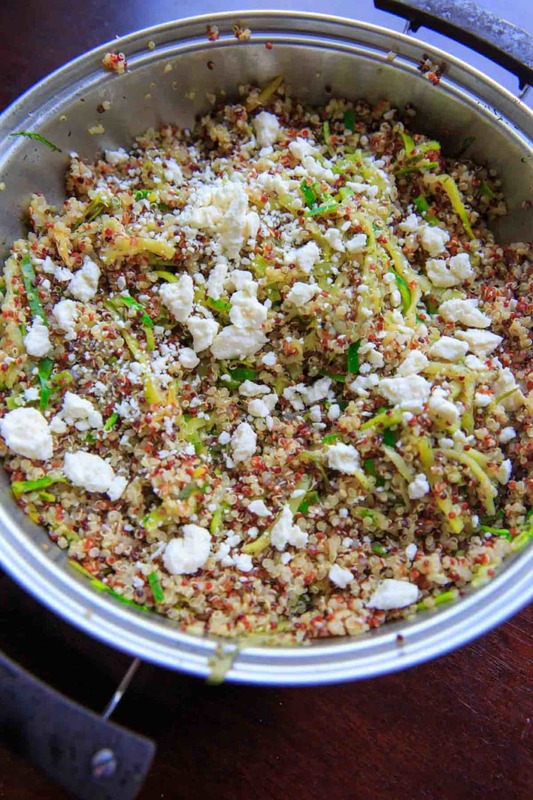 I flipped to quinoa and then zucchini in the book and compared the pairings they suggested. Then I realized the missing ingredients were tomato and lemon juice! Not only does the tomato give it that pop of color, but it really rounds out the flavors. And citrus juice always adds a little somethin’ somethin’. So it may not be a casserole but this salad ended up as a win! Cook quinoa according to package instructions. 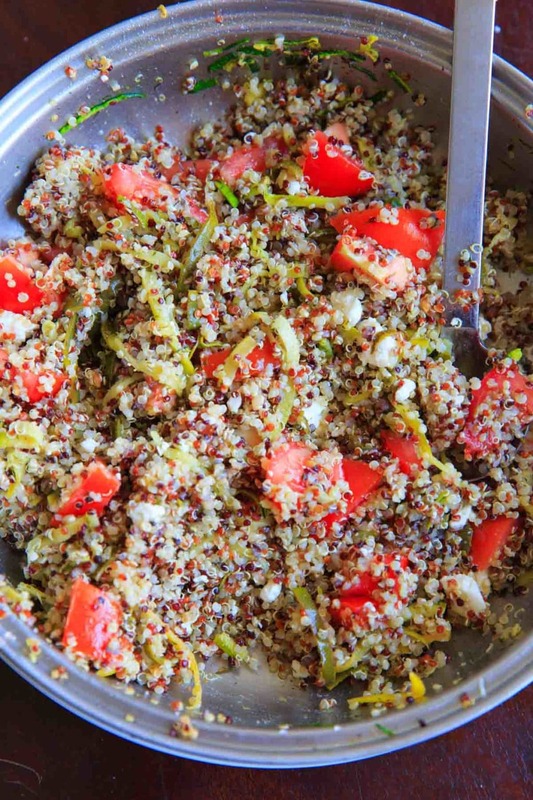 (Usually 1 cup quinoa with 2 cups water brought to a boil, then cover and simmer for 12-15 minutes). When all water is absorbed, remove from heat and mix in cumin. 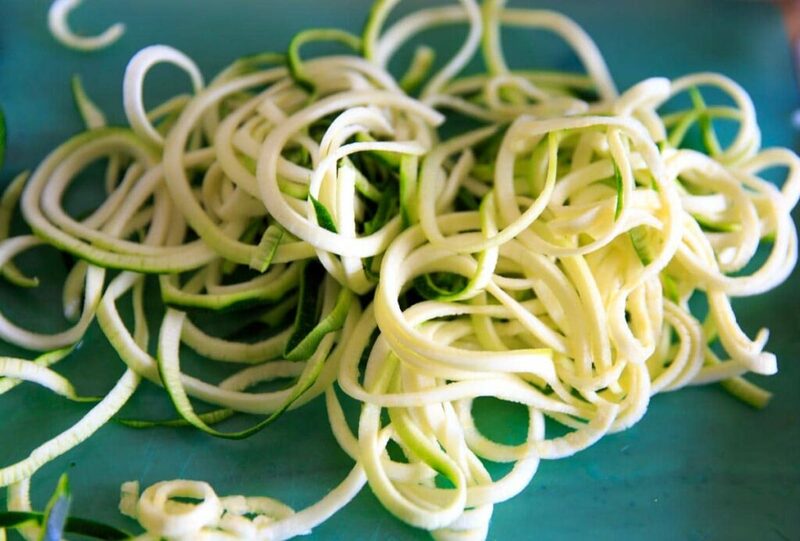 Meanwhile, use a vegetable spiralizer on the zucchini to make noodles ("zoodles"). Heat oil in stove pan on medium-high heat, and add zucchini noodles and dill seasoning. Saute for 2-3 minutes until tender. 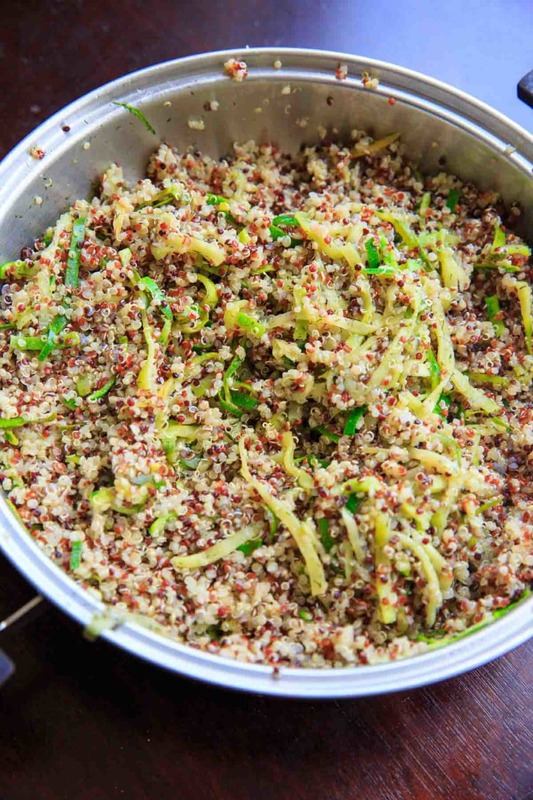 In a large serving bowl, add cooked quinoa mixture and zucchini noodles. 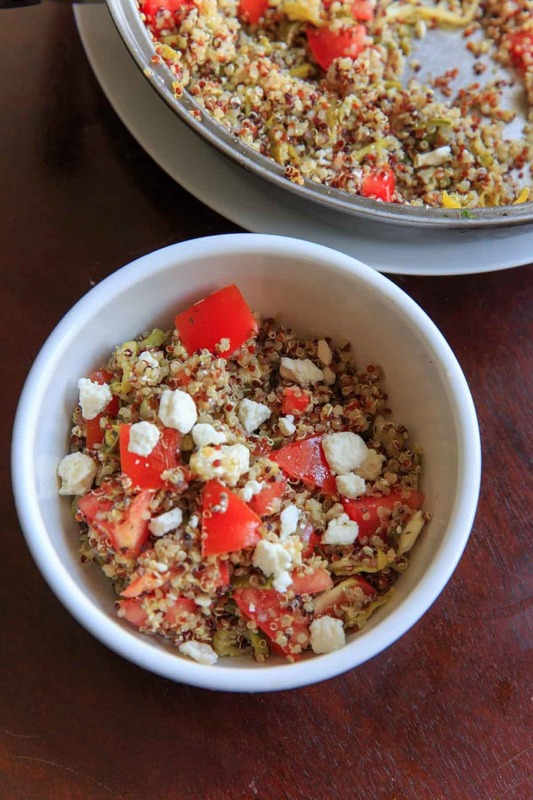 Toss in tomato and feta cheese. Sprinkle with lemon juice and salt. Serve warm or refrigerate to serve later cold as a light meal or side dish. 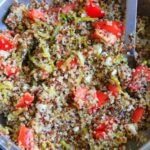 *I prefer to eat this salad cold after it's been in the fridge for at least an hour, but can still be enjoyed warm! If you like this recipe, you might also like this black bean quinoa salad or this butternut squash quinoa casserole.